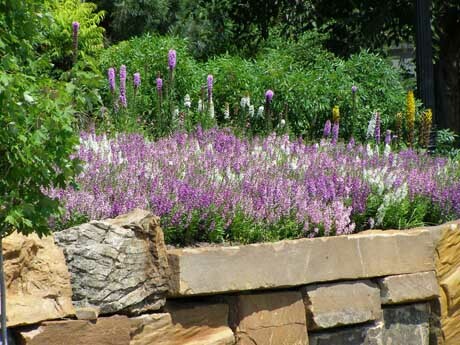 Angelonias, aka summer snapdragons, look similar to antirrhinums but tolerate more heat. 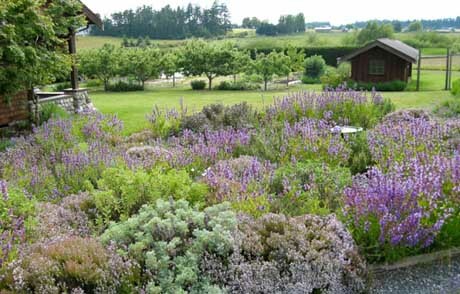 They’re also perennials, whereas snapdragons (antirrhinums) are annuals. 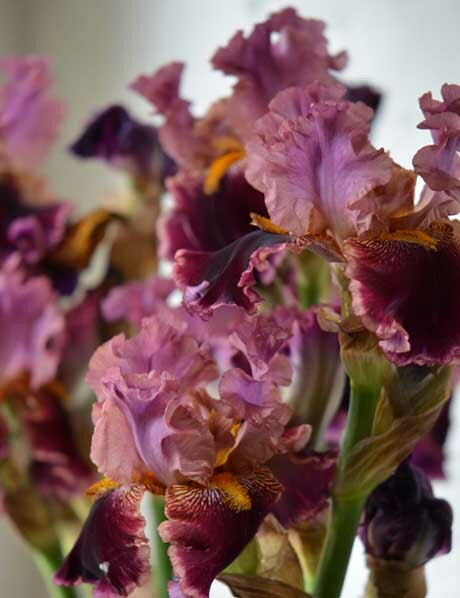 Flowers come in shades of pink, purple or white and last for 10 days in a vase. 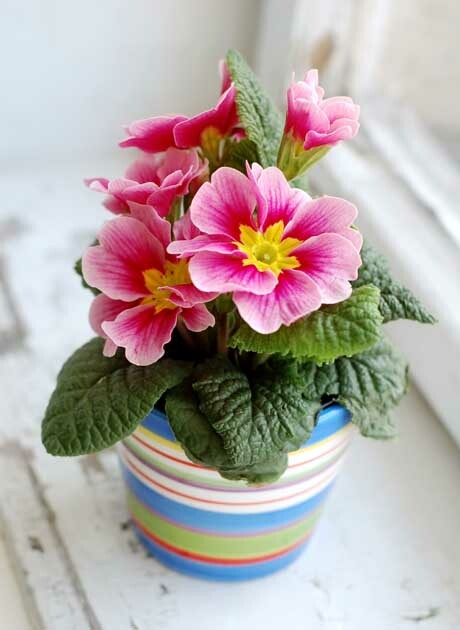 Grow them in the garden or in pots in full sun. Seeds are available from Egmont Seeds. Photo credits: The top photo comes from Serenity in the Garden; the bottom one comes from here. My obsession for baskets continues. 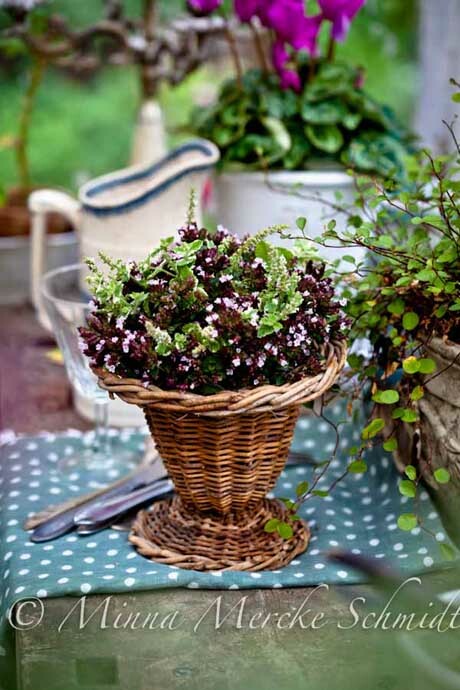 How sweet is this herb bouquet in its wicker ‘vase’? 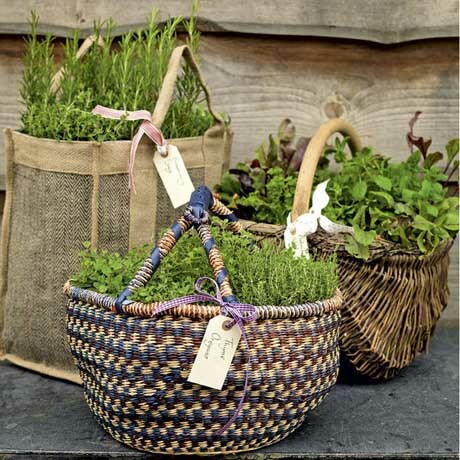 You could also plant your herbs in the basket (choose basil, coriander, thyme, etc) and include it on the table when dining outdoors. 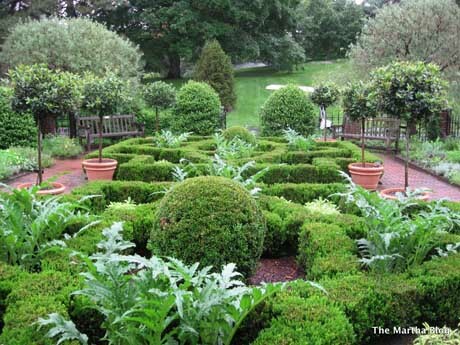 Guests can help themselves to fresh herbs. This lovely idea comes from Blomsterverksad. 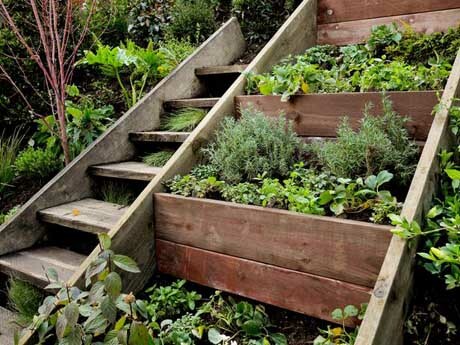 Here’s a snazzy trick for growing herbs in small spaces. 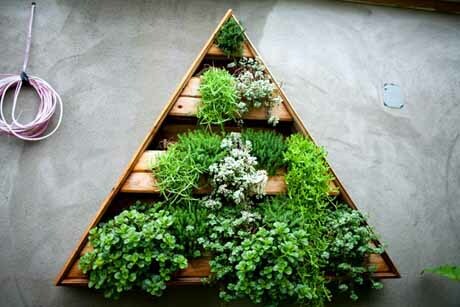 Build a triangle-shaped planter and hang it on your wall. This fabulous garden hangs over at the rustic Isa restaurant in Willamsburg (check other garden pics out here), where the owner grows some of the restaurant’s produce on the roof. Clever, I say. Truly, I almost had heart failure when I saw these beautiful containers. 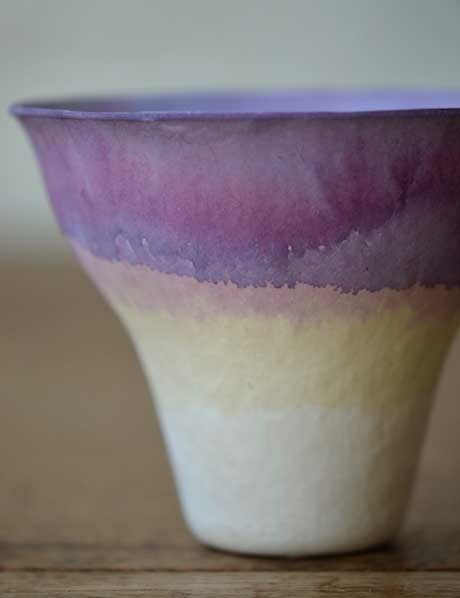 Tie-dyed using natural plant materials (beetroot, dahlias, irises, yarrow and eucalyptus, for example), these biodegradable paper cups turned from glum to glamour with a few strategically planned dipping techniques. The very talented gals at Studio Choo came up with this idea (see more of these exquisite pictures here). Quite ingenious. 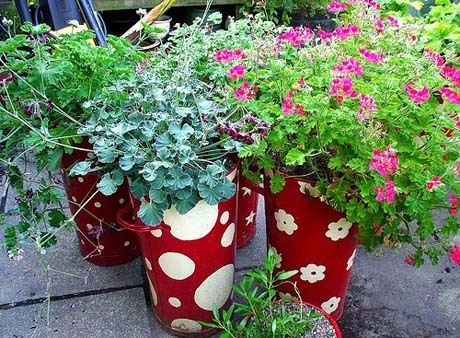 I wonder if you could do the same with porous clay plant pots. 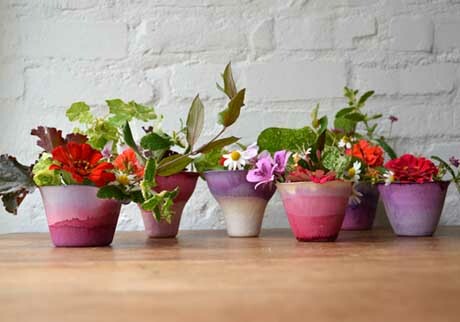 Here’s a new take on indoor gardening. 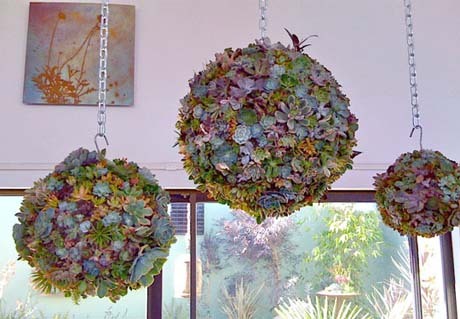 Succulent balls as houseplants. There’s no reason why you couldn’t replicate these fabulous orbs yourself, although watering might be tricky. Your best option would be too take the whole ball outdoors for a good watering and let it drip dry before returning it to its indoor spot. Succulent balls are easy to make. Just get two half-round hanging baskets, line them with sphagnum moss then fill with soil. Clip the two baskets together with wire to form a ball, then start planting! Photos come from Apartment Therapy. African violets make the perfect gift (they last forever and they’re virtually indestructible), but they’re even better when they come gift-wrapped in silver. 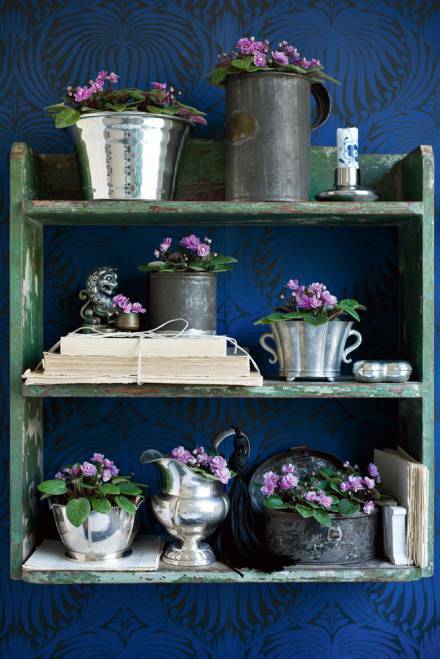 Next time you spring your friend a gift, buy a silver (or silver-plated) sugar pot, jug or bowl from your local op shop and pop an African violet inside. 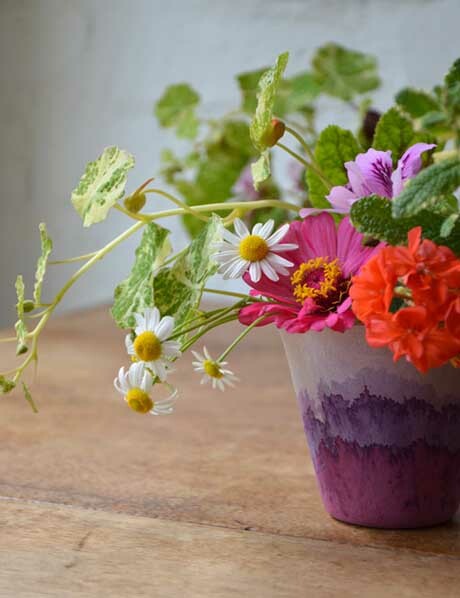 These pot plants, from this Swedish website, are absolutely gorgeous. Who wouldn’t want one of these? No room in the garden? Dodgy soil? No problem. Plant your spuds in bags or raised beds. 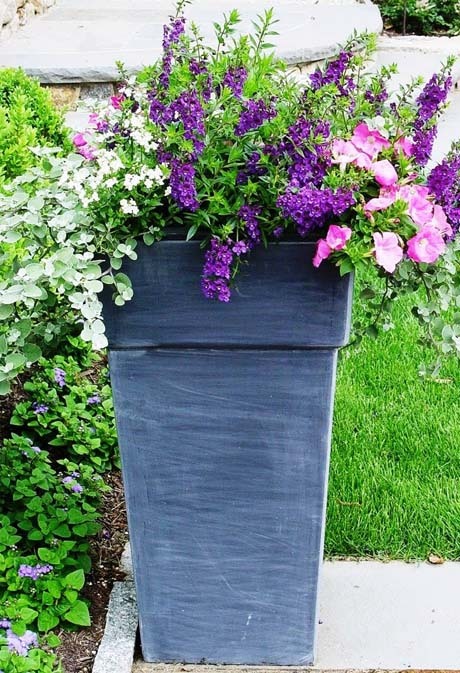 These rustic, recycled containers (featured over at Ewa in the Garden) are not only practical, they’re very very cool. 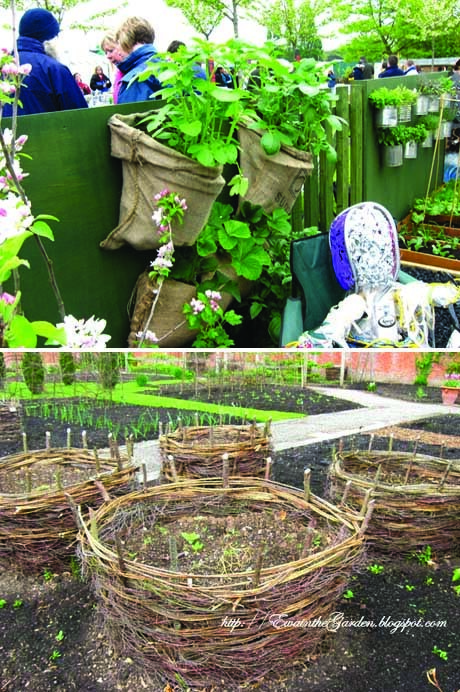 Recycle your garden clippings into woven raised beds, or reuse old hessian or coffee sacks as functional containers. Gardeners in warm areas can still get a crop of spuds in before the cooler days arrive, but cool region gardeners are best to wait until spring.